Spanking new mixed-use developments with rows and rows of empty shop spaces plastered with posters and banners screaming “For Rent” or “For Sale”. I have a question regarding real estate that I would like to ask you. I am a responsible investor and does my own homework before making any investment, so I will not make you responsible for any decisions I make. I have it down here in writing so you can have a peace of mind when you reply to my email. I am a stock investor which means I am not familiar with real estate in Singapore. I know that you have invested in real estate before, therefore, I would like to seek you help for an issue. My father made some money speculating on real estates in the past. So as most speculators who have made money speculating on real estate, my father made the mistake of not doing enough homework, not filtering out market noise (mostly the real estate agents), thinking that property prices will go up forever and not position sizing. My father laid out about (half a million dollars) on a shop unit, confident that the price of the shop will appreciate greatly in the future. He bought it in 2010 or 2011, before the building was constructed. Ever since, he has not been able to rent his shop out for rental. 70% to 80% of the shops in the building is vacant since day 1. My father has been paying the monthly management fee (about $700/month), annual property tax (no idea how much) and not to mentioned the initial stamp duties and other fees associated with purchasing a property in Singapore. Obviously, my father has not been able to find a buyer, not even if he sells it at a loss. The size of the shop is about 3m in length and 5m deep. My father laid out about half of his cash in this property and another half in another property (this has rental income, so it's fine. However, if you add the fees and taxes of both properties, my father hardly makes any money.). So my father has been very cash strapped (Situation getting more dire with every month, to be honest). Unfortunately, my father made the purchases before I knew anything about investments (not like he will listen to me though). So my question is, do you have any recommendations as on what can be our next step? Any ways to get rid of the property or anything that we can do cut/reduce the losses? It is quite a sticky situation but thanks in advance. 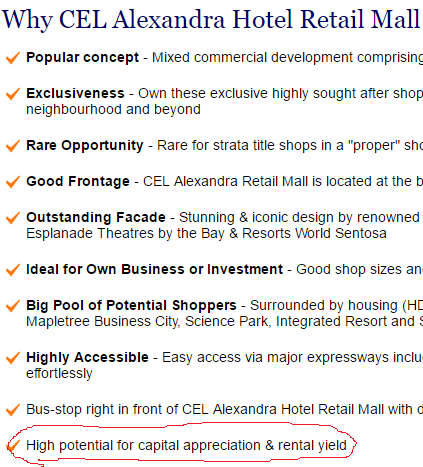 Taken from a website promoting the mall to investors. OK, fact is nobody knows for sure what the future might bring. What we know for sure is the now and the present. If we had bought into a piece of property thinking or hoping that the price will go up in future, we are more speculators than investors. Remember my blog post on the two questions we should ask if we are speculating in properties? It is not only whether the property offers value for money. It seems to me that your dad does not have deep pockets and he is suffering from a double whammy because the property wasn't value for money. I have a friend in a similar situation and it is causing a serious strain on his family's finances. I found out recently when I (being kaypoh) asked him why he seemed so cash strapped when his job pays reasonably well. He bought a property and it is not generating cash flow. Instead of an asset, he got a liability. I told him he would be better off disposing it. "What if the price goes up in future?" I told him I don't know what is going to happen in future but I see what the situation is doing to him now. Fortunately, his wife agreed that it would be best to dispose of the "asset" even at a loss. Don't bite off more than we can chew. If we bit off more than we can chew, we would do well to spit it out or else we might choke. Of course, some handle choking better than others. Quite a few could choke to death. P.S. The property which the reader's dad bought is not in Alexandra Mall. It is in another part of Singapore. 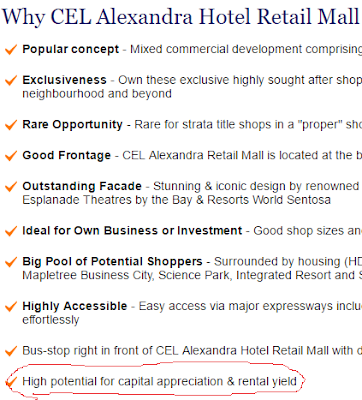 Not revealing the location of the property in question, I am just using Alexandra Mall as an example. Yes, there are quite a few of these "promising" malls which were marketed to retail investors in Singapore in recent years. Let me share my experience on this matter. Currently to be frank my properties is like generating around only 2% annually vs the paper value (slightly better than FD but still lower than the CPF interest). After deducting other expenses like taxes + management fees. However I was lucky as these properties were bought long ago with probably around 30-40% of the paper value. Also I need not pay for the loan as I don't have any loans. If a properties without any loan can only get 2% after deducting the expenses, I think those with loan will suffer even more. More so if they are not rented out. I feel for this reader... sigh. If based on 30-40% of paper value (current market price), your yields on entry costs are around 5-7%. And best of all, sitting on multiple 2 to 3 baggers despite current softness. Now that's margin of safety and holding power for you! Did I just read that correctly? SGD 500K for a 3mx5m shop.. that is SGD 33.3K per m2! Even for just 2% NET yield you need to rent it out for min 1.8K per month (incl management fees, and taxes). "Since no property name, we also cant advise. At $3000 psf cost price for retail, it's likely not prime location. Will be sadder if his location is in some part of north east sg with high supply and no mrt or office crowd nearby like kensingston square (asking rents comparable with city outskirts who will rent leh?). Maybe it will help if he reads the stats of average retail rents for cbd, outside cbd, see where it stands and decide on a fair value of rental, work out the rental yield." "I know newly minted RCR and OCR commercial space landlords who are actually subsidising their tenants. For example, I know someone who is renting out a space for $1,600 a month when he has to pay more than $2,000 a month all in. He said the agent told him he could easily rent out for $3,500 when he bought it." "It's carnage in the strata commercial space. We can't see this because of buildings being sold and bought en bloc. No one can see the pain which smaller retail investors are bearing," said Mr Navin Bafna. A resale at the recently completed PS 100 commercial block posted a loss of about $430,500 late last month - a stark sign of the lacklustre strata office market. The building in Peck Seah Street sold all 100 of its office units on its launch weekend in 2012 at the height of the market. PS 100 was completed in the fourth quarter of last year and only about 20 units are occupied. More strata industrial properties were sold at a loss this year as rents and prices continued to weaken. In particular, the proportion of unprofitable deals for shoebox units spiked from 6% in 2015 to 22% in 2016 to date. Shoebox industrial units are defined as those that are less than 150 sq m. Savills says the monthly rents for its basket of prime factory and warehouse properties tumbled 6.3% q-o-q to $1.50 psf on average in 3Q2016. Sharing an article about commercial space(strata mixed used development) to you and your readers. I believe the article clearly describes your reader's dad situation right now. By the way one of my properties lease expiring soon. Hopefully can renew it if not returns will be negative! :( still need to pay the maintenance fees! But looking back, I probably should have paid more attention to increase the gain of my investments and not just keeping cash and putting it into properties. Personally, I won't advise buying strata commercial space for investment purposes, especially the newer development. Most of them are structured to fit into the budget of the investors rather than actual feasible space to operate as a shop/office. 3m x 5m, that's around 161sqft. What kinda profile office or retailer would fit into it ? There are, but it's gonna be pretty limited. Supply, and demand dictate the returns. As for own retail use, if you want footfall, you'll be better off in managed mall. Just take a look around all malls. The strata one (katong shopping center, beauty world, sim lim tower, sim lim square, bugis cube, etc) are normally not as well managed as the managed mall (capitaland, fraser, etc). Overtime, they don't do mall revitalization as well. e.g. Compass One, Funan Center, Downtown East, etc just/is doing a revamp. Look at the strata, most of them never did and will never do as strata owner will have to foot the cost, it's next to impossible to pass the resolution to do so. This will be in the mindset of the potential tenant as well. Cheaper rent, but no footfall, worth it ? Unless the business is unique enough to do without mall footfall, then perhapes. 3m x 5m ? Quite limited. 2 years back, I went to Bedok Walk to take a look at these shoe-box shop units, about 100 sq ft selling for $5,000/sq ft. This worked out to half a million dollars. Luckily I didnt take the bite as I felt the yield will not be good. For residential properties, it is not much a better investment nowadays. The rental keeps dropping and with the current oversupply situation, it is harder to get tenants. After discounting the management fees, agent fee, property tax, income tax, repair cost (you have to repaint, do touch up after the lease expiry) you are getting at best 2% return. I would be much better off keeping the monies in CPF or invest in Reits. I made quite a bit from reits post 2009.I made the mistake or investing in commercial ppties with my friend.Now stuck with low rental.So every mth has to feed them. Now we can't sell.The small shops no buyer.Those strata titled shops all cannot make it.No anchor tenant.No foot traffic. As ppties illiquid!!! And must do due D.We did not do any due D....I am blinded by greed.That time Alexandra Central selling price broke record.I have my reservations in small shops but I changed my mind after reading about Alexandra Central .I blame myself for my greed. Hi loke thanks for yr sharing. Yr story is familiar to me. I bought an industrial warehouse but cannot sell it at good price furthermore it does not generate positive cashflow. The part on over leverage is useful. Think a lot of people if bother to read may have a shock. And these are not young people hor. In my experience, real estate agents gives the worst advice because they want to sell you something regardless, and if they are such good investors, they won't be agents in the first place. I have learned through experience to do my own research and not to take the words of salespeople as the Gospel truth. -.-"